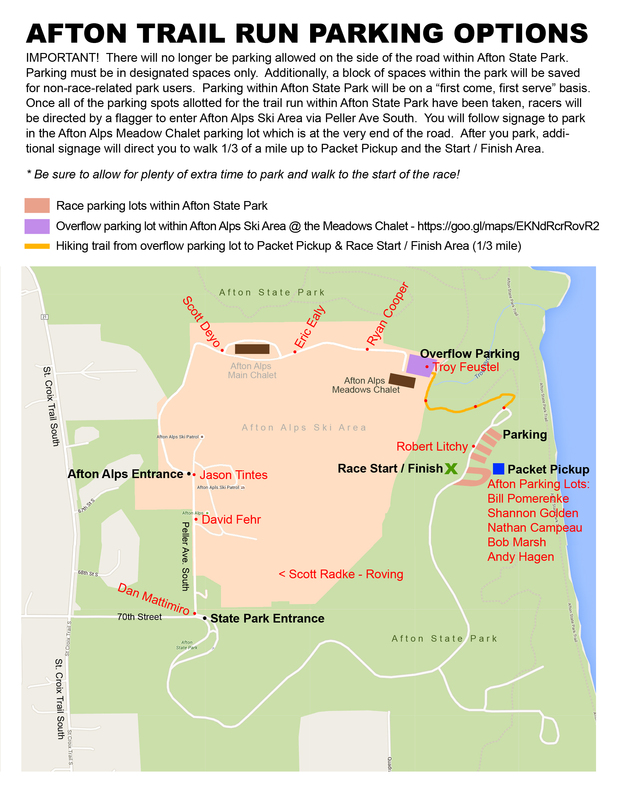 Hi Parking Volunteers!New this year at Afton is a little more complex parking plan. Sorry for the long email but if you could take the time to review the email and attachment, that would be super helpful! The state park has asked that we no longer allow cars to park along the “park road” after the designated state park parking lots are full – so the solution is that we will have overflow parking down at the the Afton Alps Ski Area Medows Chalet parking lot – runners will be able to hop onto the parks trail system from there per the attached map to walk about 1/3 of a mile to the race start. So the plan is that once the lots (less 20 spots or so for non-race related day users and a couple of spots for anyone who is running drastically late to the race) are filled, Robert Litchey will call Dan Mattimiro who will be at the enterance of the park and tell him to start diverting cars down to Afton Alps. Dan will also be in phone contact with Troy Feustel who will be down at the Meadows Chalet parking lot just in case some communication is needed. Once parking is pretty well finished up at the state park, those helping in the state park lots lots can walk down the trail leading up to the park from Afton Alps to provide direction to those walking up – those are indiated by the red dots on the map without names by them. The attached map shows where everyone on the parking team will (roghly) be stationed. Robert Litchey has a good handle on what is going on at the Afton State Park parking lots and Scott Radke will be overseeing everything outside of the Afton State Park lots, making tweaks as needed – I will be reviewing the entire plan on the ground with Scott, Dan and Troy on Friday so they will all have a good handle on what is going on. If anyone happens to have an extra safety vest, bring it and you might want a headlamp as well. This is the first year we have had to do this so communication will be key. Thank you all for the extra attention to this. Please let me know if you have any questions.